Compared to other genotyping methods and platforms, pyrosequencing technology offers the unique advantage of providing quantitative measurements of every allele. This property makes Pyrosequencing the premier choice for allele-specific expression analysis, loss of heterozygosity, and studies involving mixed populations and sample pools. 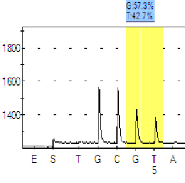 The amplification signal in Pyrosequencing is proportional to the amount of genetic material and nucleotide present in the order of the sequence. As a result, it is possible to quantify allelic variation when the amplification signals are compared to reference peaks. Ideally, their sum would equal the signal level of the reference. Pyrosequencing technology quantifies alleles by identifying heterozygous SNPs and quantitatively measuring the amplification of each allele. This technology can help identify and mark epigenetic phenomena such as X-inactivation and genomic imprinting, situations in which multiple alleles are not expressed equally. Loss of Heterozygosity is a biological phenomenon frequently associated with oncogenesis, usually describing a situation in which one remaining tumor-suppressor allele is silenced. This can produce various complications and malignancies. EpigenDx can detect loss of heterozygosity on a global scale using the Affymetrix CytoScan HD microarray at high resolution. Pyrosequencing technology in allele-quantification mode may detect LOH in individual groups of bases, provided enough SNP sites are covered in the analysis. 8006 Assay Design – Standard In silico assay design for PCR and Pyrosequencing analysis. 8007 Assay Design – Gold Assay design for Pyrosequencing analysis.